This morning Gordon and I chose to move our regular Wednesday morning swimming spot from Bountiful Lake to the Great Salt Lake. We met around 6:20am at Black Rock, which I learned is a historic spot where the pioneers came to celebrate their first 4th of July in the valley. When we got out of our cars, it was warm and breezy. We walked down to the shore and started wading into the water. The water was nice, probably somewhere in the mid to upper 70's. This was my first time swimming on the south side of the lake and the water was MUCH cleaner than it is around Antelope Island. We waded into the water for quite a while until it was deep enough to start swimming and then set our sights on the Great Salt Lake Marina and the blinking red yacht buoys to the northeast. It was quite a ride! With the wind pushing us from our back, at times if felt like body surfing. If you want to know what it is like to swim flat, you need to swim in the Great Salt Lake. The salty water is honestly better than a wetsuit for buoyancy. Once we got near the GSL Marina, we found the line of permanent buoys that are used for yacht racing. 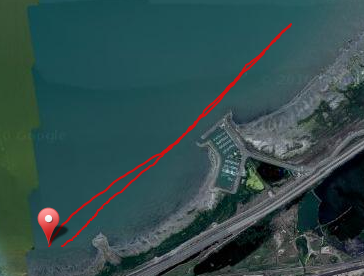 We followed the buoy line that runs parallel to the shore and then turned around at the last buoy. The buoys are great for swimming because they are bright red or green and each one has a blinking light on top. The water was pretty choppy on the way back to Black Rock because of the wind. More than once I got a mouthful of salt water. This is one reason that learning to breathe on both sides is important. I was able to switch from bilateral breathing to breathing just on my left side to avoid the chop in my face. After all was said and done, we swam about 5K in just under 1:30. So why did we choose to swim at the Great Salt Lake this morning? I may as well let the cat out of the bag...myself and a few others are working on putting together a new open water swim for 2011. We were there this morning to check out the conditions and to swim part of the course. 1. There is a long history of open water marathon swimming at GSL and the idea of starting it up again is exciting. 2. It is a unique venue because of the salty water. 4. Utah is famous for the Great Salt Lake. You are not a real Utahan unless you have been swimming there. 5. The Great Salt Lake Marina will be awesome for spectators since they will be able to see the entire race course. 6. On-site showers and bathrooms. We are still in the very early planning stages, but already have a lot of support. Keep checking back for periodic updates.